Thanks to Kjaisa Gifford, First and Bloom, and Mikasa for providing their services and/or products for this post. As always, all opinions in the post are my own. YAY! I am finally getting around to launching (one of my most favorites) Decorskapes a.k.a Home Decor tab on my blog. 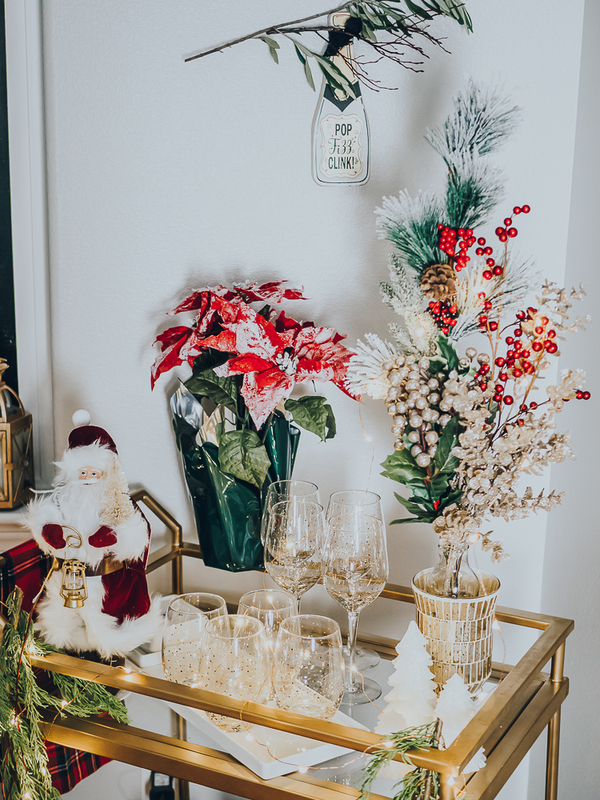 Favorite because, I love decorating, I always have and buying a house this past year has given me the freedom to go crazy executing those bazillion ideas (especially when the hubs doesn’t stop me, shh) which were floating around in my head for a long long (really long) time. I know, I know, this is going to be a work in progress, cuz those ideas never die, and even before I am done executing one there’s a dozen more waiting in line screaming at me to pay attention to it first. So yea, here’s to never-ending home projects! And this post is way overdue... my original plan was to post this back in December, before the holidays, so people could draw inspiration from this simple tablescape to decorate their own, but then I failed (I will be first to admit), I just couldn’t make the time for it with everything that was going on - planning for the holidays, shopping, setting up the place (we still have long ways to go before it’s all done), hosting family and traveling, all of this while running behind a hyper-energetic baby. But hey, at least it’s a great way to start the New Year right (to put a check mark against one of my pending projects). 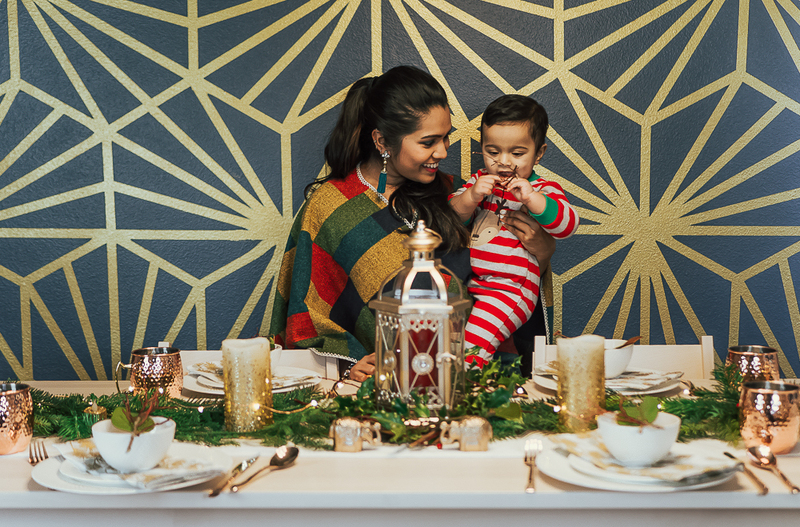 Plus, you can use this idea and decorate your dining room any time of the year, or let’s just say we are getting started early for the holidays (which is only 11 months away ;)). 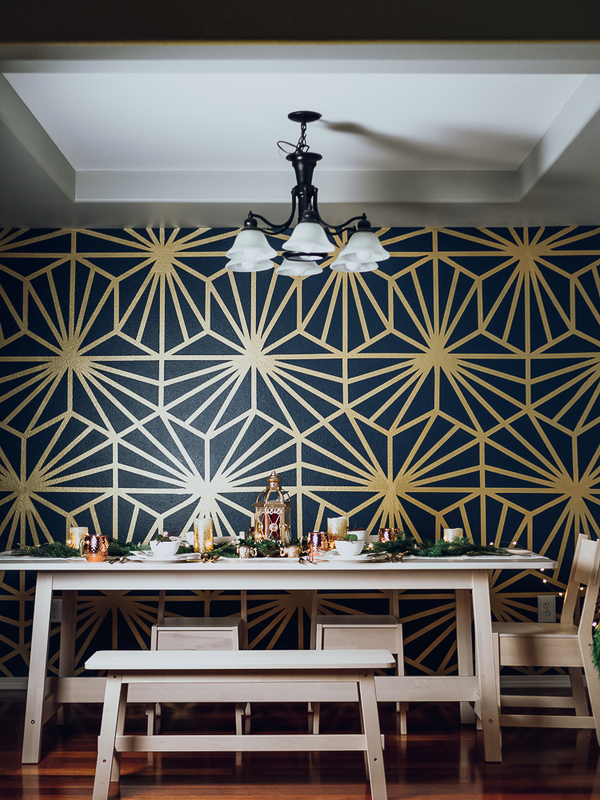 Alright, now that I am done with my yappity yap, can we stop for a minute and admire my drop-dead-gorgeous dining room accent wall first!! 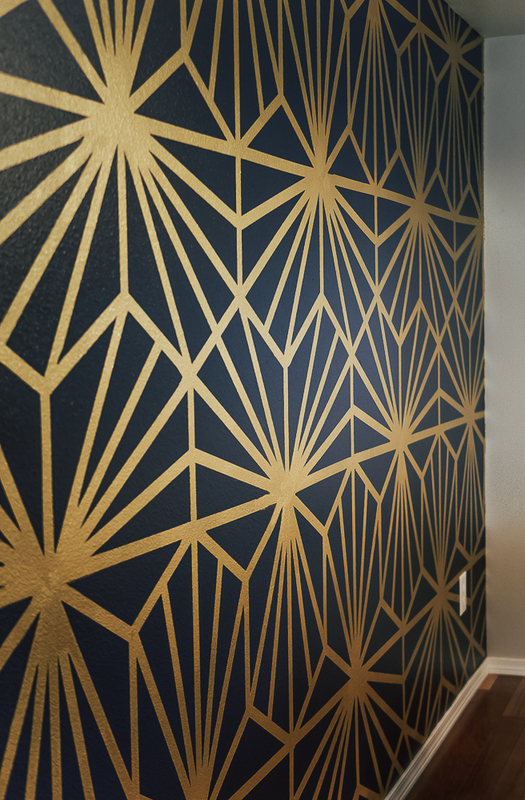 We have accent colors in every single room of the house (I am all about the colors; bright, bold, vibrant, well, if it wasn’t already quite evident from my blog and IG feed), but this one takes the cake - royal blue color, gold deets, and sleek patterns, heck yeah! 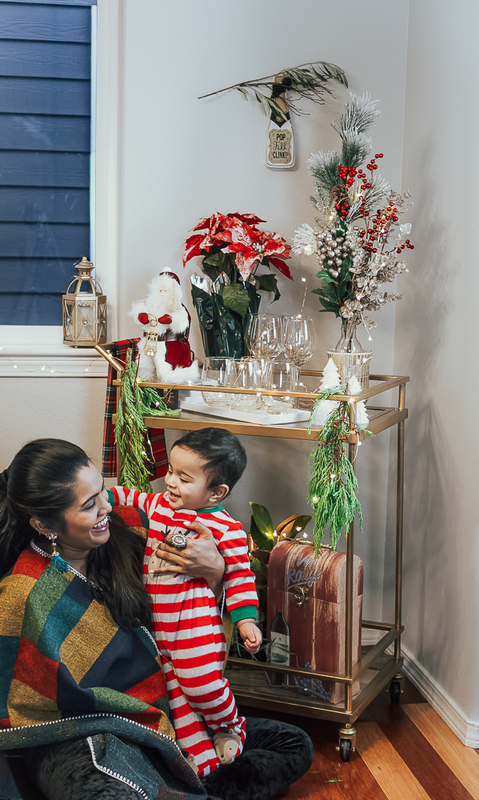 Our family and friends who visited us after this space was set-up have all gone gaga over just how beautiful this little corner of the home is (including people's reaction to a sneak peek of this post on Instagram). And this wall was accented by an amazingly talented local artist, Kjaisa Gifford. You might think, but why the dining room? It is cuz our living room already has a beautiful fireplace, so we chose our dining room for the project. 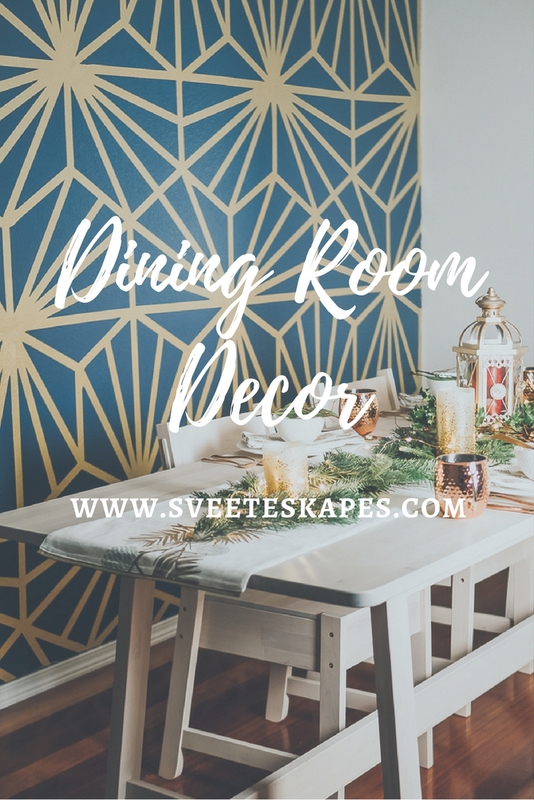 We had already gotten the accent wall in the dining room painted this royal blue color (Indigo Batik from Sherwin Williams) when we first moved in, and Kjaisa did the gold patterns over it. She did a darn fantastic job, started way early in the morning at 7am and finished the same day at 11pm (back last summer, making her way around an unpacked home, when this dining room still housed an old couch and a ton of other things that didn’t belong in the dining area haha). My only gripe initially was that these golden lines were a bit too thick for my liking but they are sort of growing on me (but if I were to do it all over again, I would surely stick with half the thickness of these gold lines). 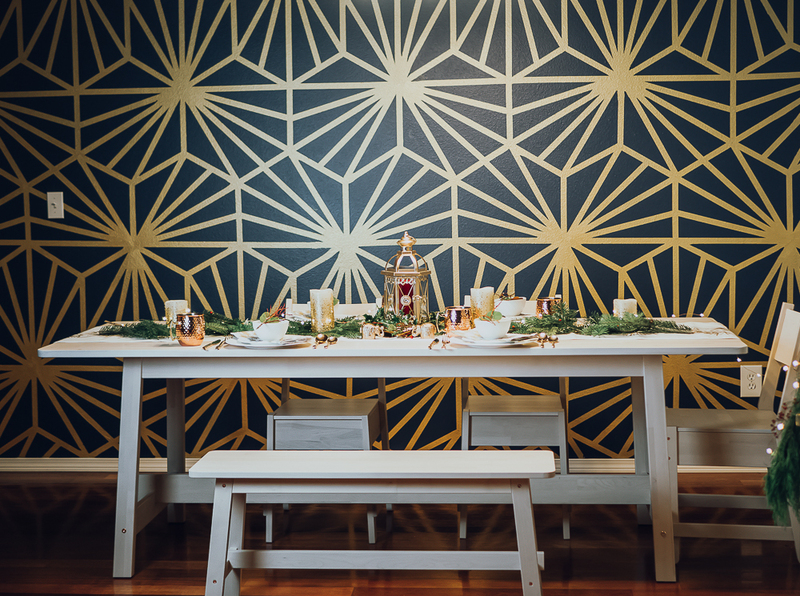 If you are local and are looking to bring some glamour into your house, Kjaisa Gifford is your girl! Check her out on Instagram, Facebook or directly Email her even. 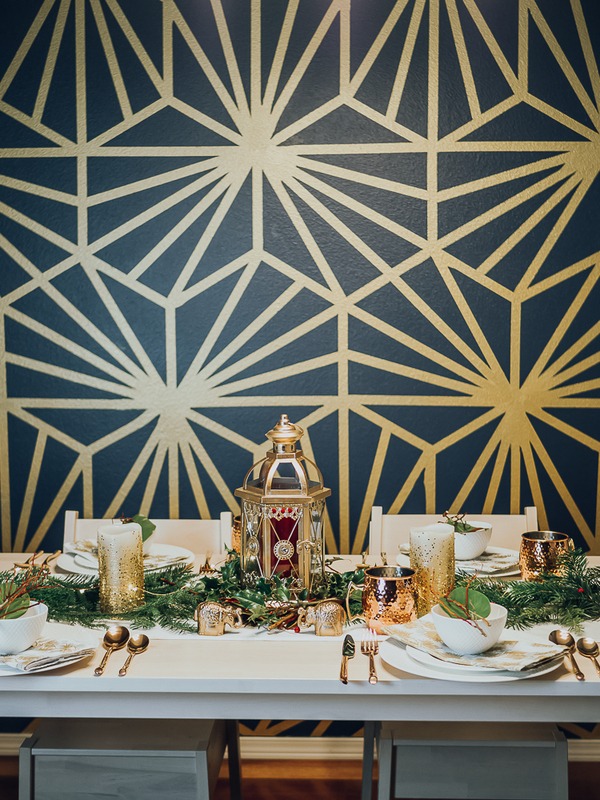 Since the accent wall already makes our dining room look glamorous, I wanted to keep the rest of the dining area simple and classy, with gold and rose gold accents of course. 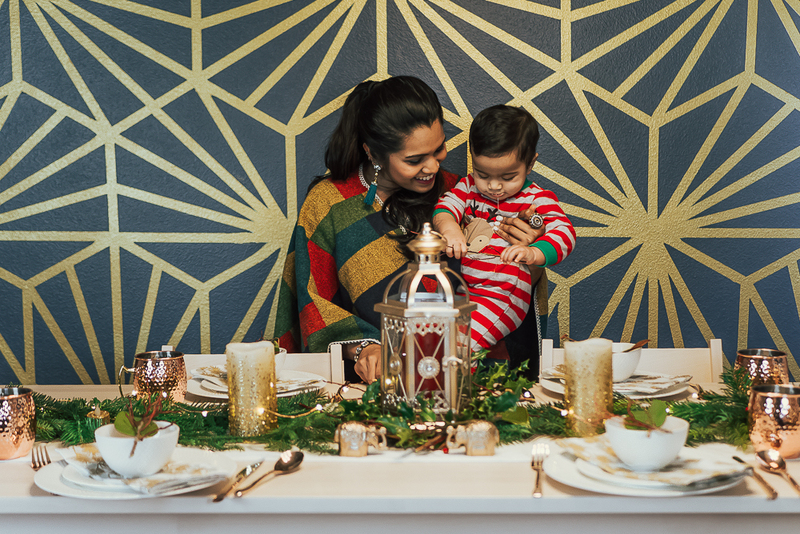 I have always been obsessed with metallics, even before the entire blogging world jumped on it to decorate their homes, maybe it has to do with the fact that I am an Indian and I was surrounded by copper, brass, silver and gold home decor while growing up. 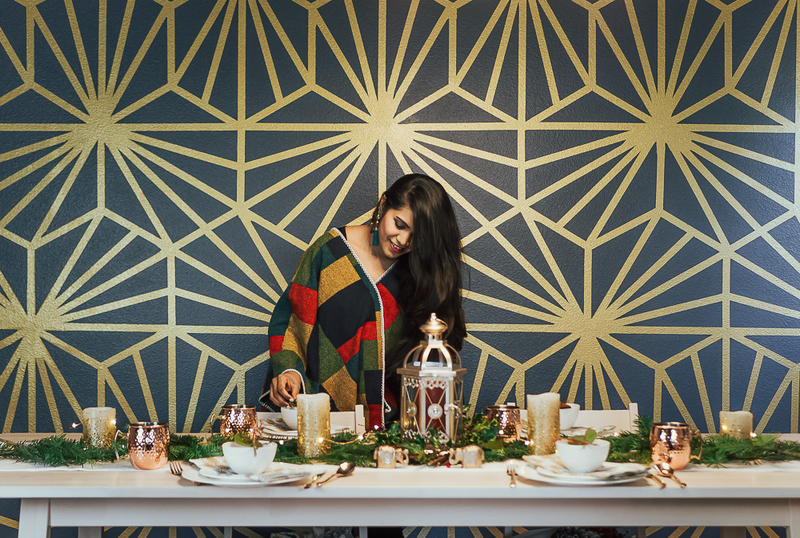 But my obsession with gold and rose gold home decor is on another level (if it isn’t already too obvious). We started furnishing the area with a super simple dining table, with chairs and a bench (I have wanted a dining table with a bench for a long time). And a stunning bar cart in the background (did I say it had to be gold?). I am thrilled to have found this one at a great price during Thanksgiving (I didn’t spend an entire week shopping for nothing, haha), it’s one of my most favorite purchases in 2017 (speaking of which, I should probably write a post about my favorite 2017 purchases, what say you guys?). And as far as the gold accent goes, they look great year round, both during the holidays and the rest of the year as well. So I only need to switch out a few things to make this decor work during those no-special-occasion months. 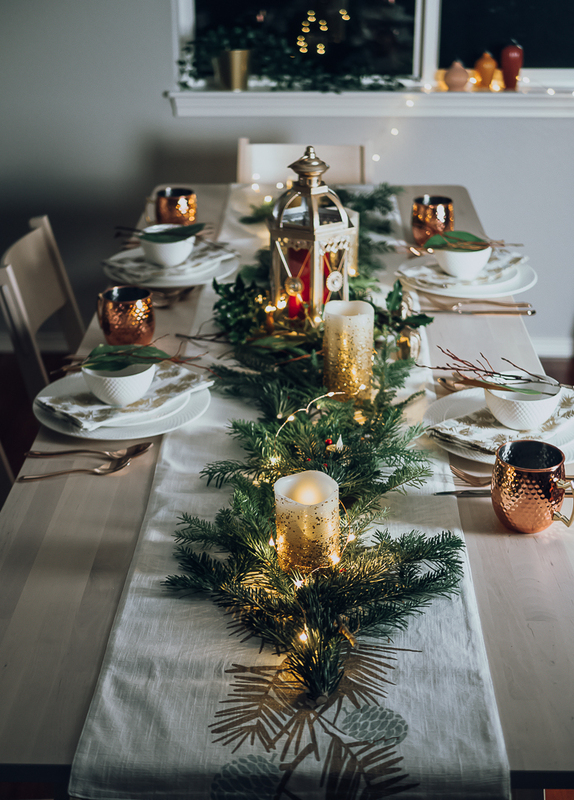 As far as the tablescape goes, I put something together real quick because my favorite FitApproach community approached me to do a Facebook Live Session for their followers and I couldn’t say NO. Thanks to the pressure of signing up to lead that sesh, which was a great thing in a way cuz my dining room is the only part of the house that is almost set-up (this boring chandelier, an outlier, will have to go, as soon as I find one I love!). To decorate the table, always start with a vision in mind and pick your favorite colors. I went with white, gold, rose gold, lots of green and pops of red in keeping with the theme of the holiday season. 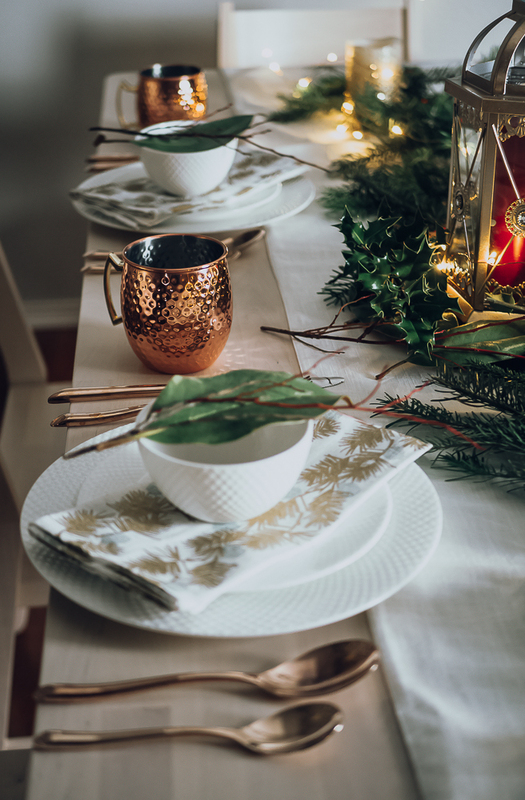 A nice table runner and matching napkins are a great starting point (and to tell you the truth, I had bought 5 different linen sets before I settled on these, and my family asks me why I spend so much time shopping, going to at least a dozen different stores for one thing lol). Opt for fresh greens, pines, pine cones, holly berries if you have them available, thanks to Tammy of FirstandBloom for my supply. But if you don’t, then head over to your nearest craft store (Michael’s, JoAnn, Hobby Lobby, etc) to pick out some inexpensive ones (watch the video where I show you some examples, and while you are at it, please ignore all the mixed up terms I used :-o). Pick your favorite centerpiece, both in terms of color and style. I had two options but I finally went with a simpler gold lantern and put a red candle inside it. 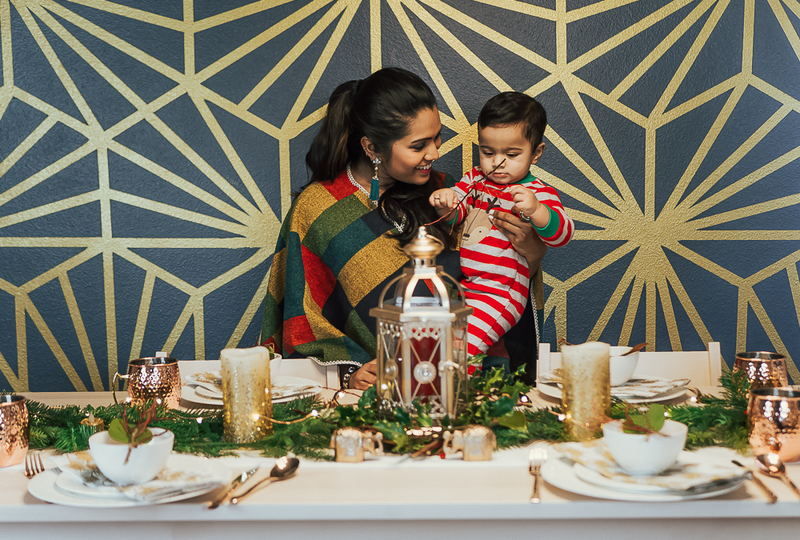 Intersperse the table with pops of red and more gold (candles, berries, lanterns, etc). 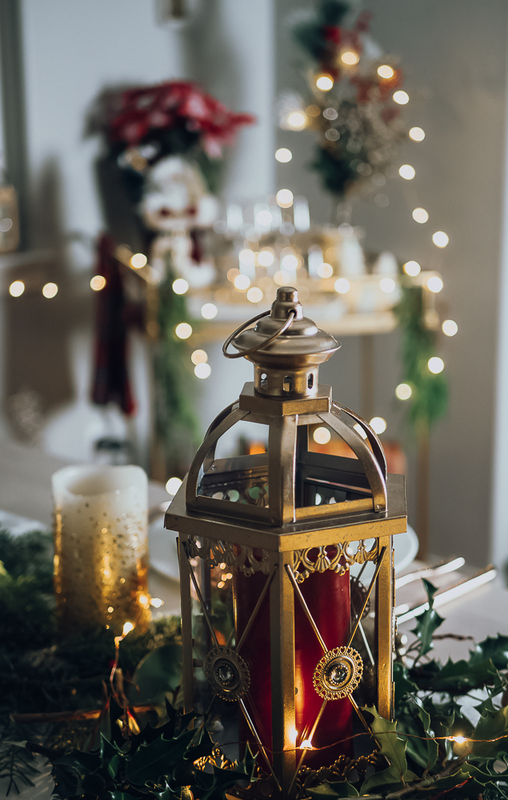 And do NOT forget twinkle lights (thanks to my darling hubs who ordered these for me even before I ever mentioned about them, talk about being a perfect blogger husband huh!). And for the plate setting, I opted for my favorite white dinner set. 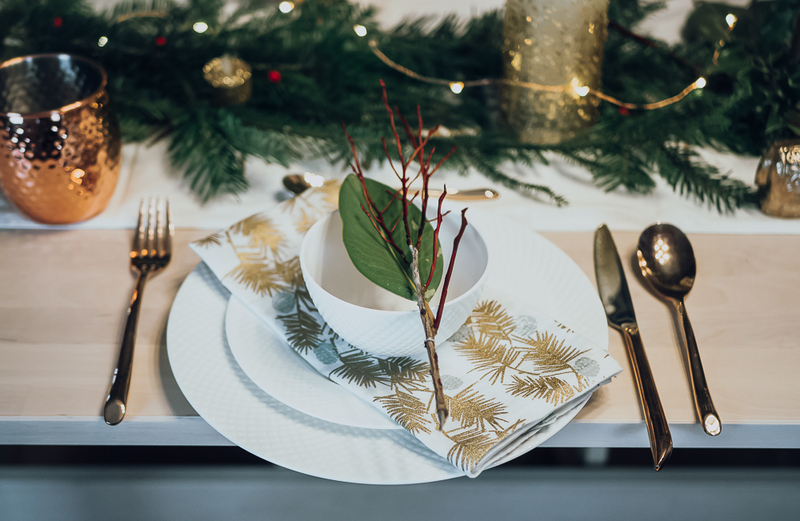 Layered with a beautiful white and gold napkin and used green leaf + red twigs to bring it all together. 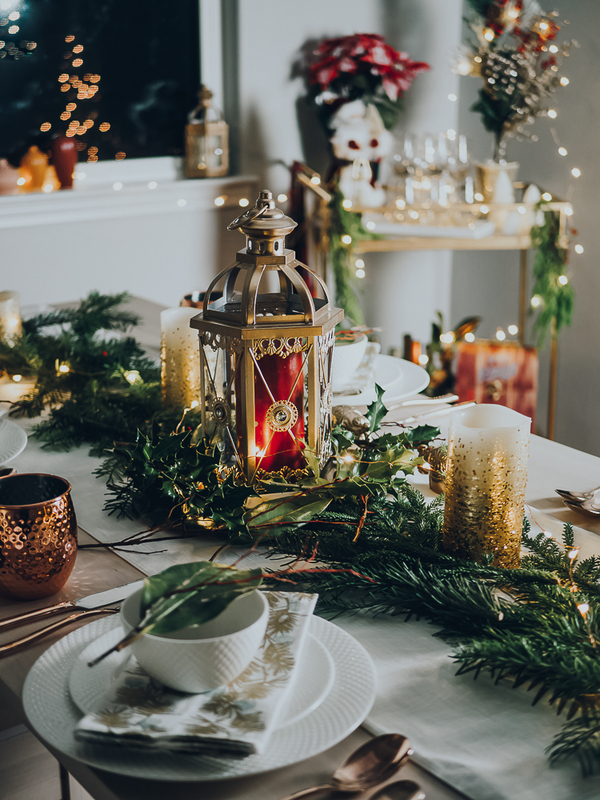 With some rose gold cutlery and Copper Moscow Mule included, my festive holiday table was ready in no time. Honestly, it was really easy and effortless to put this together (the hardest part was over once we had made up our minds about which dining table to buy after scouring over several websites, haha). 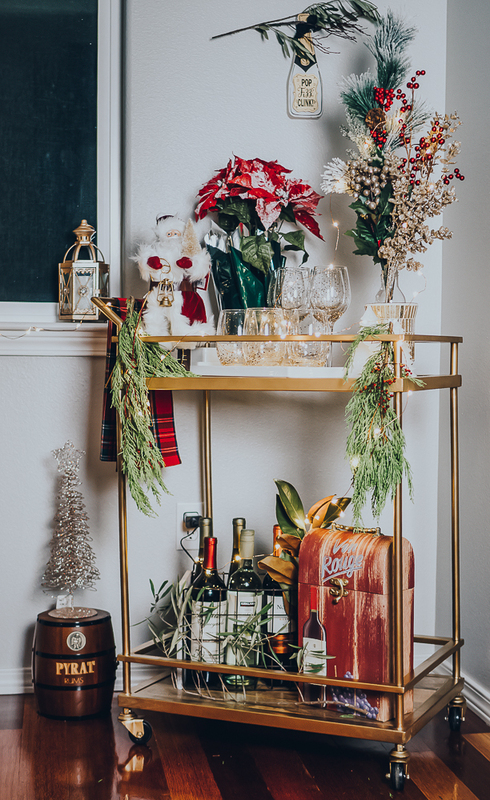 Now let’s talk about the Bar Cart. 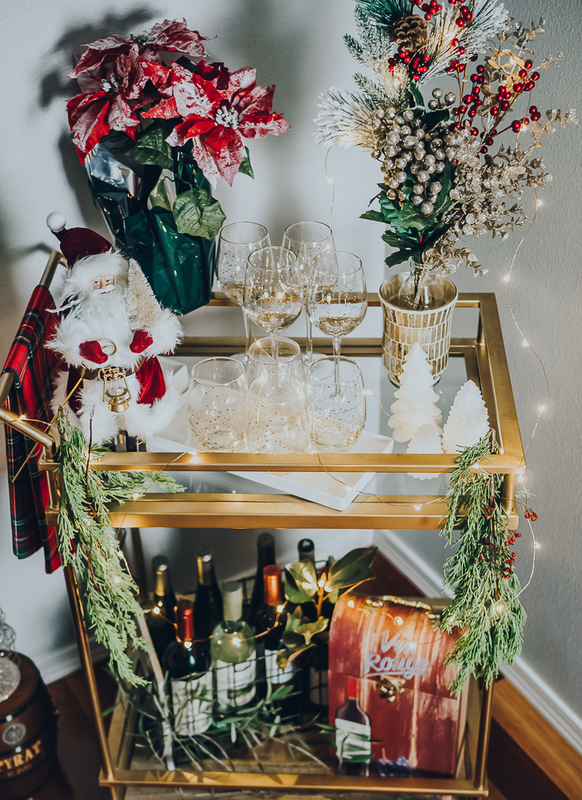 Actually, this one’s a no-brainer… just pick out your favorite drinks, bottles (since both the hubs and I love wine, those are the only drinks you see in our bar cart), glassware, etc and put them all in the bar cart. 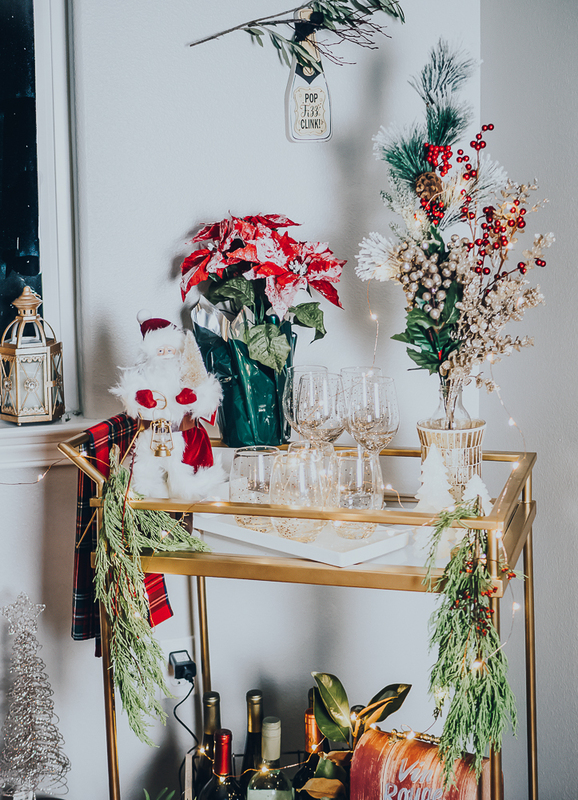 For the holidays, I picked up a cute Santa and used the leftover greenery from my tablescape to decorate the bar cart. Include details like that ‘Pop, Fizz, Clink’ wall hanging, candles, flowers, etc to tie it all together. Mama, I like your earrings, can I pull one off, pretty please! That’s it… See, that wasn’t too hard at all! 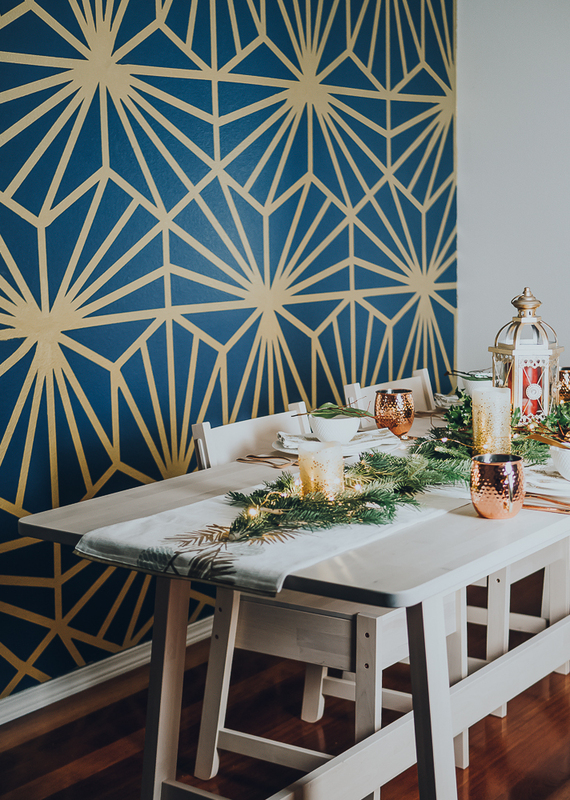 The important thing is that your home should reflect your own personality and taste, so begin with what appeals the most to you, get creative and have fun while decorating your little abode!